I have tried many vegetarian burgers, mostly hating all I’ve tried. Morningstar and Boca are not for me. I had a black bean burger at Manna Grocery on a visit to my hometown and discovered that veggie burgers could actually taste good! I decided to give it a go and make my own! 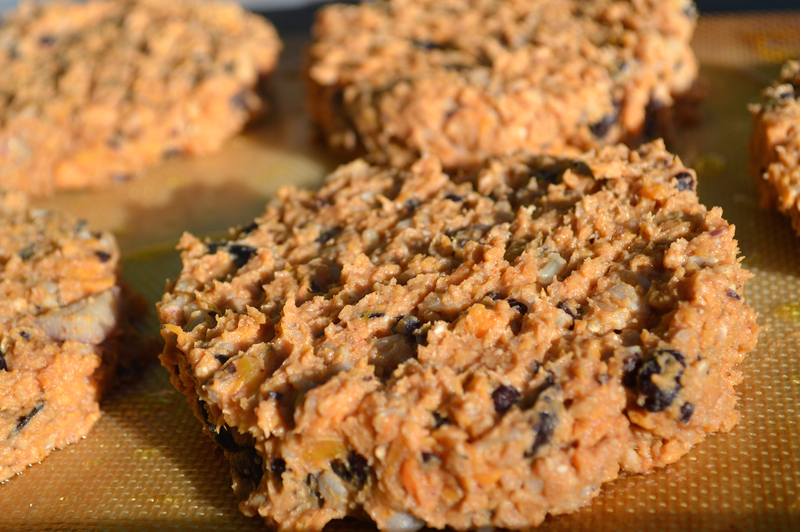 Sweet potatoes are the key ingredient to the flavor of this burger! Save yourself some time and microwave those puppies! Poke holes in two, large potatoes on both sides. Place on a microwave safe plate and nuke for 8 minutes, adding time if not fork-tender. Set aside and allow to cool. Rinse and drain 1 can of black beans. Place in microwave safe bowl and cook for 3 minutes. Smash 3/4 of the beans with a fork until a paste is formed. Set aside. Chop 1/2 cup red onion in food processor until onion becomes a liquid. I think this adds moisture to the burgers. Dicing the onion is fine also, if you want a bit of crunchiness. Grind 1/2 cup pecans in a food processor until mealy. I used frozen pecans I keep in my freezer. The Magic Bullet works great for this recipe. I used it for the onion and the pecans. <br /> <br /> Boil 1 cup of brown rice according to package directions. Set aside. 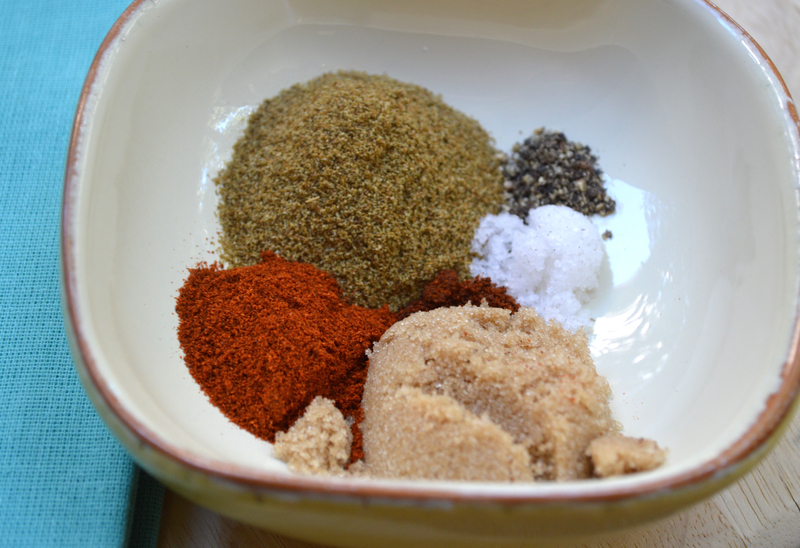 Combine 2 1/2 tsp ground cumin, 1 tsp paprika, 1/4 tsp chipotle powder, 1 Tbsp brown sugar, 1/2 tsp salt and 1/4 tsp pepper. 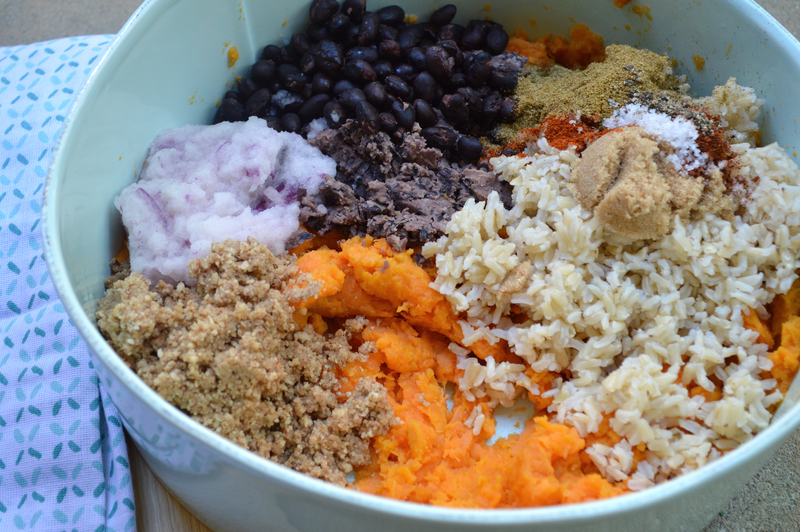 Combine smashed and whole beans, brown rice, mashed sweet potatoes, pecan meal, red onion and spices along with 2 cloves minced garlic. After mixing well, use a burger press to form into patties, placing each burger on a prepared baking sheet. I drizzled a bit of olive oil onto my silicone mat to add flavor and ensure they didn’t stick. Place in preheated oven at 375°. Cook for 35-40 minutes, flipping after 20 minutes. Serve on sesame or bun of your choosing. 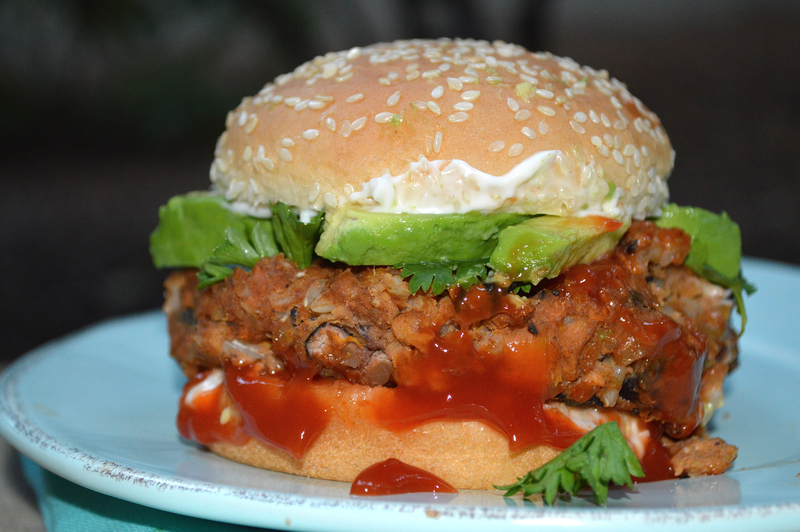 I dressed with sliced avocado, mayo, ketchup and some fresh parsley and cilantro. This is a very messy burger. But, if a burger ain’t messy, it ain’t a good burger ya’ll! *something you may not know: eating even a few meatless meals a week certainly has its health benefits! Vegetarian diets are associated with weight loss, reduced risk of heart disease and lower blood pressure. Vegetarian meals are typically lower in saturated fat, higher in fiber, potassium and an array of vitamins. Plant proteins are incased in plant cell walls which makes it a bit harder to digest than animal proteins. Therefore, building a protein-rich veggie meal is an important part of getting adequate protein. Be sure to include plenty of whole grains, beans, peas and lentils and tofu. Cheese, eggs, milk and yogurt are good sources of protein as well as calcium. If you prefer to pass on the dairy products as well, be sure you are eating loads of dark green, leafy vegetables, drinking non-dairy milk with calcium, including tofu or other soy products and eating calcium-fortified cereals. Weight-bearing exercise is also important for maintaining bone strength. Scroll down for the to print this recipe! A pie so delicious, it will become a family holiday necessity! 1. Combine cream cheese, sweetened condensed milk and lemon juice in mixer until smooth (small lumps are okay). 2. Pour mixture into crust. Cover and refrigerate for 30 minutes to overnight. 3. 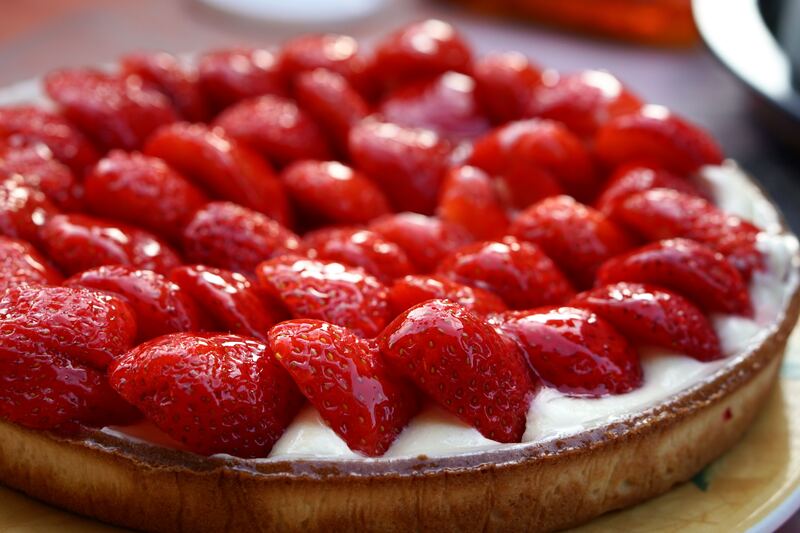 Just before serving, remove from refrigerator and top with sliced strawberries or canned fruit filling. 4. If using fresh fruit, gently warm apple jelly in microwave and baste strawberries or other fresh fruit of choice for a shiny presentation. Use any fresh fruit or fruit pie filling to your liking. I just want to come to your house and eat. It sounds awfully good!! 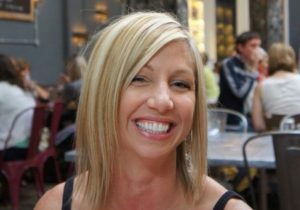 I am a cousin to your Mom and enjoy reading your blog and all the mouth-watering recipes. Would love to taste some. Thank you so much!! Come on over for dinner!! Pecans?! We have used walnuts in making veggie burgers but never pecans, will have to try this recipe soon! The pecans are a southern thing, but this veggie burger was really good! I bet it would be just as good with walnuts!